With the urge to get my Alpine-Face on, I invited Dave for a day of climbing at altitude on the South Face of the Petit Grepon. He’s been getting out a lot this year, logging more than 325 pitches of technical rock in 2007. 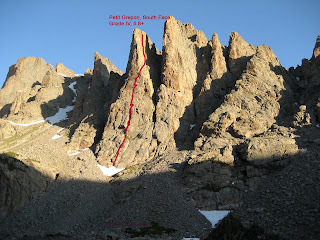 You can refer to The Mountain Project web site for the standard South Face ascent and descent details. Our adventure begins at 2:45 am with Dave arriving at my home. With a standard Alpine rack, and 2-60 meter, 8.5mm ropes we toss our stuff in the car and head up to Rocky Mountain National Park. Soon enough, Dave and I are on the trail and in just two hours, twenty minutes we hike from the Glacier Gorge Trailhead to the base of the Petit Grepon. There is already one party climbing the route. Under clear blue skies we get ready to start the climb. We enjoy the climbing and advance quickly up the route. Near the summit we see some low clouds building, then the skies go electric. With the rock audibly sizzling, we quickly and effortlessly tie our ropes together and setup the first of a series of rappels. Once safely down to our big packs, we change into trail shoes and begin our 5-mile hike out. The Petit Grepon, South Face is a stellar rock route with great holds and amazing views. Just be sure you get an early start. Two years ago I began a still unfinished film that explores the roles and qualities of dance partners and climbing partners. “Sudden Partnering” is my ongoing project that explores the various dimensions of partnering. 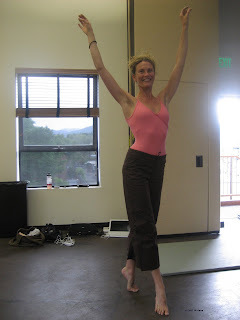 To date, most of my interview subjects have been climbers, mountaineers, and dancers. But, that list is rapidly expanding. The project has taken on a life of its own and beginning today, I’ll begin to publish interviews and film clips on this blog. So here it is, the first in a series of Person-to-Person “Sudden Partnering” interviews. Thanks to my friend Joanne Bradbury for agreeing to be interviewed. Q: Based on your highly acclaimed career and years of dance, what is the thing you like most about dance? Q: Do you think dance is a mere form of physical expression, or something more? Q: Given that your husband is an athlete - do you find similarities between your dance teaching and his guiding? Q: I understand that you climb in addition to dance. Do you have any opinions on the qualities of a good climbing partner compared with the qualities of a good dance partner? With another day of sweltering heat due to engulf the lowlands, Alison and I decided to head up to the mountains for a summit bid of Mount Sniktau. The trail begins rather high at an elevation of 11,990 feet at Loveland Pass. Tagging this particular summit was important to Alison, as she had not been up to this elevation before (out of my womb.) After rigging a pair of play sunglasses with duct tape, she felt ready for the trail. Alison accidentally forgot her good pair of sunglasses at the theater Friday, so we were left to improvise to shield her eyes from the bright sun. 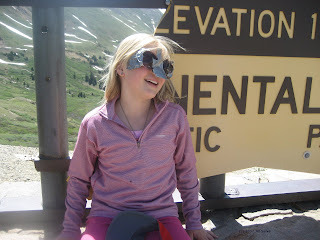 Equipped with two options, a pair of swim goggles and the duct-taped creation, we felt ready and complete for our hike. The first part of the trail goes up about 1,000 vertical feet presenting you with the choice of turning south to tag Grizzly Peak, or turning north to tag Sniktau. We were set on a Sniktau outing! One rolls over three false summits before gaining the true summit of Sniktau. For a young mountaineer, this was no “give me” hike. 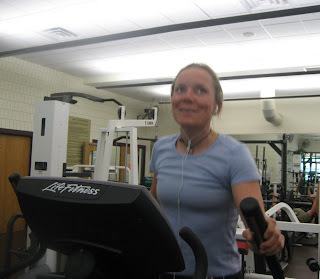 Alison earned every bit of elevation and was able to stay focused on reaching her goal. The views from the summit were incredible and I thought about coming back with trail running shoes to cruise along some of the ridgelines. Our descent was uneventful and we felt satisfied at having reached such a beautiful peak on a beautiful day. A must do (at least once) for anyone who enjoys the high country, especially good for beginning hikers, flatlanders, desk jockeys and the like. On Saturday, June 9th I had the opportunity to shadow Andrew Councell as he guided Mary and Steve on their attempt of the North Face of Longs Peak. This well-read, young, vivacious couple traveled here from our nation’s capitol, Washington, DC. We began our day by meeting at the Colorado Mountain School at 1am. 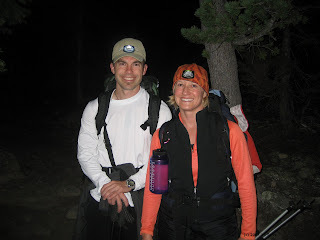 Mary and Steve were wide-eyed with excitement and ready to hit the trail. After a short drive to the trailhead, we threw on our packs and started our ascent. We encountered mild temperatures and a clear night sky as we wove our way up to Jim’s Grove. It was there that we started to encounter 30-40 mph wind gusts as we crossed intermittent snowfields. Once the sun came up, I was surprised at the amount of snow on Longs majestic North Face. Although both Steve and Mary had trekked high passes in Nepal and sumitted Rainer, they were impressed with the scale and seriousness of this North Face route. At Chasm View, our high point, this lovely couple decided to pause, take in the views, and then call it a day. While we looked over at Lambs Slide at 8:30 am, the Notch Couloir spewed off an avalanche! The sound was loud. Just a week ago, Park Ranger Jim Detterline had taken two rangers up the Notch Couloir and then down the North Face. It seems that the newer snow from this week didn’t adhere to what was already in the Couloir. The Diamond looked amazing and I wondered what it must be like to climb it. Thankful for having such an amazing job, my thoughts swirled and I marveled at my good fortune, my beautiful daughter and more. This afternoon while lifting weights at the North Boulder Rec Center, I looked up and saw my friend Caroline George (Caroline Ware before her marriage to Adam). About one year ago, I had the pleasure of meeting Caroline for the first time. She was then, a guide for my current employer, the Colorado Mountain School. 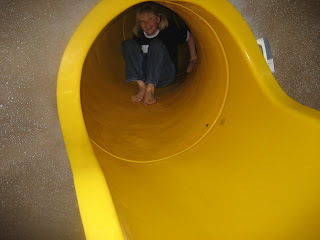 Since that time Caroline has continued to challenge herself on rock, snow, and ice by climbing around the world. When I last saw Caroline and Adam in Ouray, they were all smiles while belaying and swinging their tools. This guiding duo has stopped in Boulder for a few weeks of training before heading out to Jackson Hole, WY where they will guide for Exum this summer (starting June 26th). As the first American woman to climb the three great north faces of the Alps – The Eiger, the Matterhorn and the Walker Spur on the Grandes Jorasses, Caroline continues to be an inspiration. Her positive disposition and endless quest for interesting new lines spurs me on to keep exploring. In a couple weeks, Caroline will be traveling to New Hampshire for a rock clinic and slide show – Click Here to get more details.